Now that March is in full swing, many may find themselves running on fumes of January's resolutions, or perhaps the dedication to the "new year, new me" mantra has been abandoned entirely. 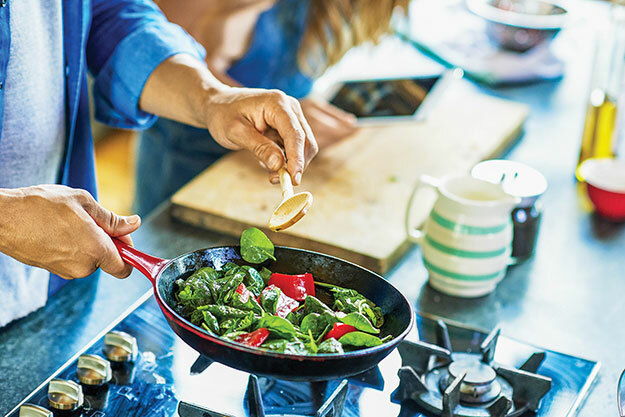 Fortunately, Pacific Medical Centers' Registered Dietician Christy Goff, MS, RDN, CD, is on the scene to discuss food and nutrition, guiding the wayward health-centered ambitions back on track towards success and ultimate fulfillment. Can you explain how the aspects of food, health, and fitness all relate to the concept of nutrition? Nutrition can encompass many aspects of people's health, including what they are eating, how they are moving, the amount of sleep they get and the amount of stress they are under. These factors can have a profound effect on one's food choices, cravings and ability to make healthy choices. For example, there have been several studies indicating that those who consistently get less than six hours of sleep each night or who are chronically stressed tend to eat more calories and exercise less the next day. We cannot ignore these powerful connections between nutrition and other parts of our lifestyle. There are so many fad diets out there. How can people determine what dieting strategies are appropriate for them as an individual? Fad diets are extremely popular in our culture because they encourage fast weight loss and are seemingly quick fixes to health problems. However, most people who have been on a fad diet can tell you they have gained the weight back that was lost, or quit shortly after starting because of the restrictive nature. I do not recommend many diets due to their negative outcomes, possible nutrient deficiencies and short-term mindset. Instead, I encourage people to have realistic expectations about their health concern and to start small on their desired changes. Progress doesn't always happen as fast as we want, but if we can turn our thinking into more long-term lifestyle changes rather than fad diets, we will be a lot healthier as a culture. Is there a core set of guidelines you suggest most people follow in regards to nutrition? Work to increase your fruits and vegetables to 5-7 servings daily. It has been proven that eating high amounts of fruits and vegetables can prevent chronic diseases such as heart disease and cancer, yet many of us fall short of this recommendation. Cook with more whole foods. This will almost always be healthier than buying something at a restaurant or in the frozen section, due to the huge reduction in sodium and filler items. By eating minimally processed foods, we are automatically increasing the amount of nutrient-rich foods we consume. Eat mindfully. We are a fast-paced culture that often eats quickly in many nontraditional places like a car, in front of the TV or at a work desk. By taking the time to breathe and pause between bites, it helps us feel less stressed and reminds our brain to stop eating when we feel full. What piece of advice can you offer to busy military personnel who are looking to make improvements to their health but have a hectic work schedule? Start small with your health goals. It is hard to change everything at once, so pick something on the top of your list that you value and outline some strategies to get started. It is also helpful to remember your barriers in completing the goal, so you can problem solve and make a plan before they occur. Some examples to focus on include reducing sodium, increasing healthy fats or adding more fiber. Remember small changes can result in a big impact down the line, especially if it becomes a regular habit. Is there anything else you would like readers to know about nutrition? Nutrition is a challenging field because recommendations frequently change. While the media may put a dramatic spin on studies, know that these conclusions aren't always fact. My advice is to be careful of what you read on the Internet, or even in a book about nutrition, and make sure you know the source. If you need information, it's best to look for articles and books that are written by a registered dietitian or, book an appointment to get more personalized care.